In order to better understand Russian people, we publish 10 interesting facts about Russia, its history and modern time, nature, people and their interrelations with surrounding world. Russia is the biggest country in the world whose territory is about 17 million square kilometers. From east to west it covers 10 time zones. Russian territory is twice bigger than the USA’s territory. 17, 100, 000 km² (Russia) and 9, 834, 000 km² (USA). Germany is 48 times smaller than Russia – 357, 000 km², while England is 128 times smaller than Russia – 133 000 km². Russia’s territory approximately equals to the territory of the planet Pluto. The largest volcano in the world which has been active for the last 7 thousand years is located in Russia and it is called Klyuchevskaya Sopka. It is 4 kilometers 850 meters high, but its column of ashes reach 8 kilometers. The volcano gets higher with its every eruption. The deepest lake in the world and the biggest source for drinking water is Lake Baikal. The lake is filled with 23 cubic kilometers of water, and in order to fill the pool, which is equal in volume to lake Baikal, all the largest rivers in the world must flow continuously for almost a year. 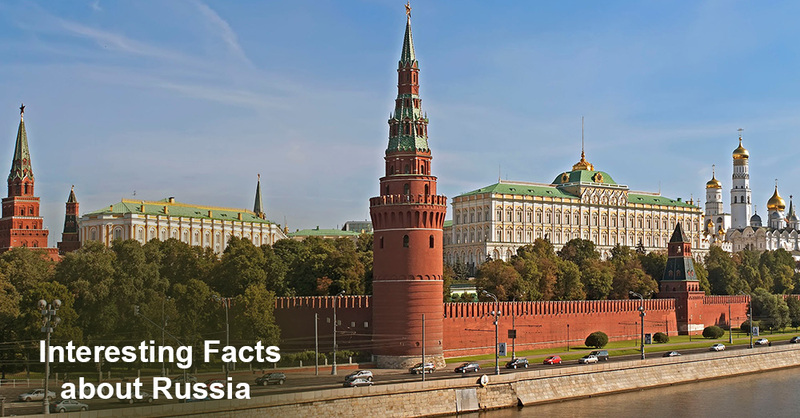 The world’s largest medieval fortress is the Moscow Kremlin, which is located on the left bank of the Moscow River. Now it is the official residence of the President of the Russian Federation. The length of the walls of the Kremlin fortress is 2,235 meters. The Hermitage is the largest and oldest museum in the world which has 3 million exhibits. If a person wants to see all the art objects in the Hermitage spending only 1 minute on each of them, he will need to go to the Museum for 25 years, 8 hours a day. Russian city of Oymyakon in 1924 set a record of cold which was -71.2 degrees Celsius. Russia is the only state in the world which borders on 12 seas – the Baltic, Black, Azov, Barents, White, Kara, Laptev, East-Siberian, Chukchee, Bering, Okhotsk, Japanese seas. There are 2,000 libraries, 221 museums, 100 concert stages, more than 80 theatres, clubs, and community centers, 62 movie theatres, as well as 45 art galleries in St. Petersburg, in Russia. The oldest mountains in the world – the Urals – are located in Russia. They appeared about 4.2 billion years ago. They are located in Kusin region next to the village Aleksandrovka. Nowadays, there are only bottoms of the mountains left, although they used to be really high. The Urals used to have a few historic names – the Big Stone, the Siberian Stone, the Earth’s Belt, and the Belt Stone. Peterhof, one of the most beautiful and amazing palace and garden complexes in the world, is located in Russia. In addition to the magnificent palaces, in Peterhof there is a huge number of fountains (about 176) which amaze not only with their beauty, but also their size, since 40 of them are really huge. We have presented only a small part of the most interesting facts about Russia. We hope that after having read this article you have discovered a lot of new and useful information about Russia!